Consumption Tracking and Eco-Devices RT2 Energy Manager. One product to supervise everything. Products will be shipped as of march 11th according of the order date. Track your electricity consumption, Photovoltaic panels's production, water, gas, fuel simply with only one device. Control heaters, optimize hot water production, reduce energy-consuming items and save money ! 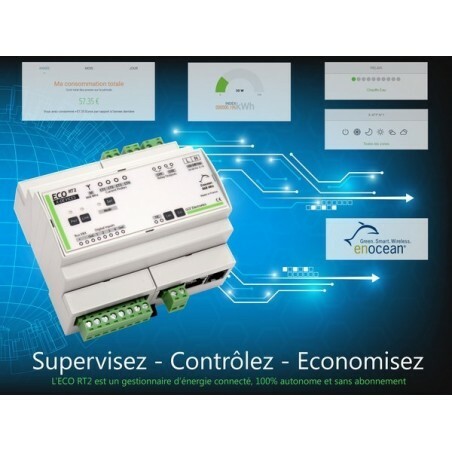 Ecodevices RT2 is a 100% autonomous IP power manager (no remote server or subscription). It has a powerful scenario engine for accurately managing up to 64 power stations depending on events such as rate changes, indoor or outdoor temperature, power overrun (load shedding), etc. Simply use the browser on your smartphone, PC or tablet to connect to the Ecodevices RT2. Its 100% graphical interface responsive adapts to all screens. It's equipped with Enocean technology and can communicate easily via internet with remote servers, home automation boxes or any device with Radio Enocean technology. Ecodevices RT2 save consumption index during 4 years. A graphic engine allows to visualize the different consumption curves. Data can be exported in .csv format. Many options and extensions are already avialable and allows to extend Ecodevices RT2 capabilitys. 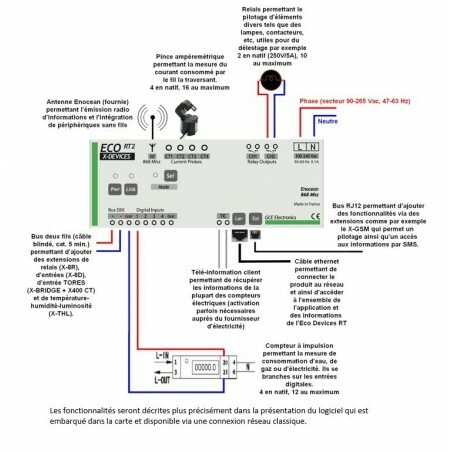 GSM communications, warnings and sms control, heating management by pilot wire 6 ordres, ddition of additional inputs/outputs, temperature sensors, humidity, brightness etc. 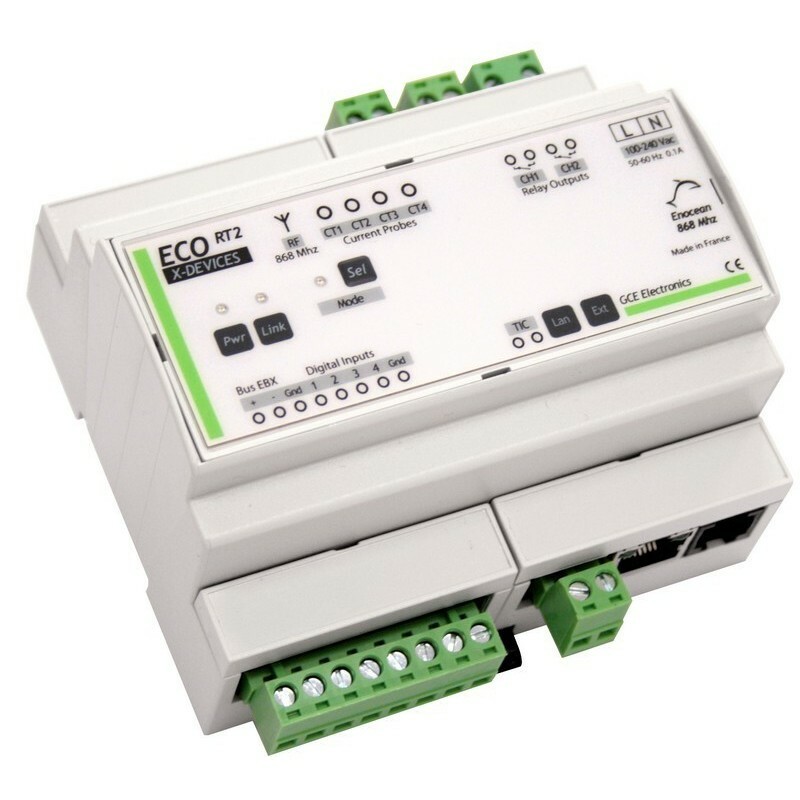 Like all our products, Ecodevices RT2 is constantly evolving. Thanks to the active participation of our user community we regularly add new functions and make corrections to improve the products according to user experience feedback. Ecodevices RT2 is made in France, in Nantes (44). Included : 2 current tores (50A and 100A). 1 Teleinformation input compatible with classic Linky meters. 4 Tores inputs (extendable to 16). 1 RJ12 for X-GSM and x-bridge extensions. 1 EBX Bus to add some extensions (X-4FP, X-8R, X-8D etc...). 256 programable timers (Weekly or on specific dates). 256 Customizable scenarios. Scénario engine GX©. AND, OR, NOT functions. 128 Secure e-mail warnings with customizable message to 4 recipients. Enocean transmitter, EEP A5-12- 00 or A5-12- 10, 16 tranmissible channels. Enocean receiver (24 Actuators, 24 Switches and 24 analog sensors). Automatic time setting. Summer / Winter Time Management. Internal clock. Network : 10/100Mbits, HP Auto-MDIX, cable diagnostics, IEEE 802.3az.